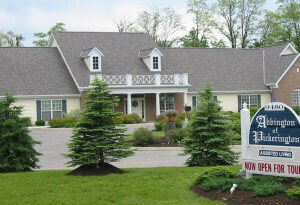 Abbington of Pickerington Assisted Living opened in September of 2000. This beautiful single-story community consists of 48 residential units situated on 5 acres of scenic wooded grounds. Abbington of Pickerington boasts abundant common area amenities, beautiful interior courtyards as well as walking paths. You will experience and appreciate the comfortable, family atmosphere unlike any other assisted living community. We invite you to contact us or call Jennifer Roenker, Executive Director, at (614) 577-0822 ext. 200 (or option 3) for a personal tour at your convenience. Abbington of Pickerington Assisted Living is located on Route 204 (Blacklick Eastern Road) approximately 1 mile east of State Route 256 (near Harmon Road) between Pickerington and Reynoldsburg. The neighborhood primarily consists of single family homes with numerous dining and shopping establishments nearby. At Abbington of Pickerington Assisted Living, we value the independence of our residents. No one wants to feel like a burden to their family. It adds stress for everyone. At our assisted living communities, the residents don’t depend on their children for everything. Instead of worrying about eating habits, medication, and housekeeping, visits can be relaxing, happy. When residents have their family visit we want everyone to be stress free. That’s what assisted living is all about. Now life can be enjoyed. While residents don’t have to depend on their families, they’re not alone. Our trained staff are available 24 hours a day. Residents can get help with any daily activity. The caring staff members are always there to make things easier. Abbington really feel like home. Fellow residents become friendly neighbors. Cozy fireplaces and parlors give character to the surroundings. And the private rooms have enough space for personal touches. It’s not a hotel or a hospital. The room becomes your own. Residents can make it a reflection of their life. Pictures and decorations are encouraged. It’s not just a place to live, it’s home. The caregivers are very helpful and always available when needed. The nurses are well trained and the kitchen works very hard to provide good food and substitutions when needed due to allergies and dislikes. The director is always available to speak with people and works hard to keep all the residents content and happy living here. The staff is wonderful and helpful. The facility is kept spotless and clean. The residents are all happy and content and I find that so important! The food is excellent and always served on time. The activities are well planned and always enjoyable. I would never hesitate to recommend Abbington to friends and family in need of a loving, caring place for their elderly loved ones. Heather has been such a big help to me since my mom's health has started to decline. She takes the time to chat with me about my concerns. Recently, my mom had a health issue. Chene called me right away, gave me a detailed account and since I was out of town for the day she made sure I was kept informed. When I got back that evening, I stopped over at Abbington at 10:00. Chene went over everything with me and seemed happy to do it. Welcoming environment, caring and competent. I’m glad my mom and I have found a good home! The staff interaction and activities have increased mom’s socialization and comfort. Everyone was very sensitive to the fact that mom was scared, in a new place and feeling insecure. The staff was very warm and welcoming which helped tremendously. Felt welcomed and cared for immediately. It is a beautiful facility with caring staff, a peaceful environment and outdoor space available. I am really impressed with how well Jennifer (Executive Director) knows and cares about the residents. Since I live so close to Abbington, I stop by a lot and see her actively involved. I could not ask for a better place for my mom and am so thankful when I was looking for assisted living that I chose Abbington for her. My mother has had a wonderful experience at Abbington for the past five years. The staff in general has treated my mom with the utmost care and dignity. My mother has made some of the following comments: "they treat me like I'm their grandma,” "they are a real angel," or when they walk out of her room she will say "they are the best."